If you follow my blog, some of you may know that I said that I was going on a book buying ban for the months of May and June. I posted a list of books I had ordered beforehand, and was going to refrain from buying any more for the sake of TBR pile control. Earlier this week, I was shelving books in the YA section of my library, and I noticed one paperback I was shelving was the third in its series. I thought to myself, Oh, I have the first one at home. I don't know when I'll get to it. It's been so long since I bought it, I'm not even sure if I want to read it anymore... When I got home that night, I sat down in front of my bookshelves, ready to take down the book that would never be read. It wasn't long before I realized that there were others like it. Books who I'd probably never read, but hadn't gotten rid of, perhaps because I felt obligated to read them after acquiring them, or because weeding sometimes makes me feel guilty. Instead of meditating on the subject, I sucked it up and pulled all the books that I had completely lost interest in off of my shelves. They weren't going to be read any time soon, and over the past few years I've tried to get rid of books I don't care about. You know how Target makes those reusable tote bags for all of your shopping needs? Before I knew it, I had filled one of those bags to the very top with books. I contemplated posting a trade list, or perhaps taking the books to my library to be donated, but a lot of them weren't in good shape, and I didn't know anyone who would have wanted them. I decided to sell them at Half Price Books, that way I could use the money I earned to buy books I wanted to own. The next day I hopped into my car and drove to Half Price Books that is situated halfway between myself and the Twin Cities, braving construction and rush hour traffic. I sold off my books, and walked away with a pile a quarter of the size I came in with, but filled with books I'd been wanting to own. Ending my ban wasn't just about selling off lots of books I didn't want and getting a few ones in exchange. Since I had pre-orders coming in throughout the month, it always felt kind of half-assed. Oh, and there's a Richelle Mead singing near tomorrow which I'll be attending, and having not read Vampire Academy, I plan to buy the first three books in the series. Even though I had books coming in, I missed going to the bookstore, picking it up off the shelves and paying for it. I missed trolling Amazon for bargains and contemplating future pre-orders (I wish online retailers would make little graphics of people using their carts like scooters, one foot on the cart with the other behind one's self in the air, whizzing through pages and pages of merchandise with glee). Even though my TBR pile is still huge, getting rid of the books I genuinely don't want to read has made it feel much more manageable, and more enjoyable to tackle. It's nice to periodically take the time to re-evaluate and figure out where my reading priorities truly lay. Earlier this year I tried to take control by assigning myself five books I would read before my birthday. As it turns out, by the time the day rolled around, I was only halfway through the first book. I may have failed at this goal, but I'm setting another. I've complied a list of ten books (including the four I did not get to before my birthday) I would like to read before going to graduate school in August. I realize that I may not get to them all before my departure, but making these lists stops me from putting them on the back burner as much as I might otherwise. I've also been trying to incorporate more adult fiction and non-fiction into my reading regime, and this list represents that goal as well. Do you guys set similar reading goals for yourselves or put yourselves on book buying bans? If so, I'd love to hear about it in the comments. Believe it or not, while I'm not exactly on a book buying ban, I have started to look at some of the boxes filled with TBRs and I realized that there are plenty of books I will probably never read. Most were bought on a whim when I went a little crazy buying used books on Ebay last year. We're talking several sets of 1,-/10 books so who was I to resist even if there were only two books that actually interested me. Now this huge box sits here (to my left, only two steps away) and it's being used as a, uhm, side table, sort of. But the point is ... if reading those books (or most of them, anyway) seems more of a bother than fun, I should seriously throw them out. 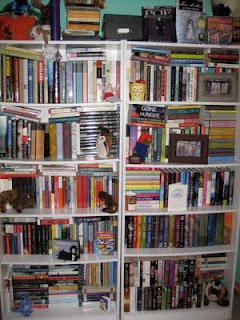 Thanks for the post :-) it made me realize I really need to do something about my book hoarding! I'll do that sorting and reassessing every once in a while too. It usually results in stacks of books being donated to my high school media center. I buy too many books for the amount of time I have for reading. A friend and I are driving up from the Rochester area for Richelle's signing tomorrow too. I am bringing one Vampire Academy from my Media Center collection which I had donated after reading and the first book in her other two series that are on my keeper shelves. I used to set myself a list of say 20 or so books to read in a half year and realized after a while that some of the same books never left that list. I tend to read what appeals to me at that moment more so than have any set reading guide to what I read next. I tried to put myself on a buying ban, but that rarely works. It was especially impossible since over the past 6 months I've had both of my major bookstores (Barnes & Nobles and Borders) close and have huge blowouts of stuff. Plus, my library has a book sale all the time where recently I've been getting deals like $1.00 for all the fiction you can fit in a bag. How can I turn that down!....it just means I need to find more bookshelves, right? I have a box of books I need to get rid of. I keep putting it off and honestly I should probably put a few more books in the box. There are quite a few books that I know I won't get to for awhile but I hope to someday. But there are also plenty of books where I can't remember why I wanted them in the first place. 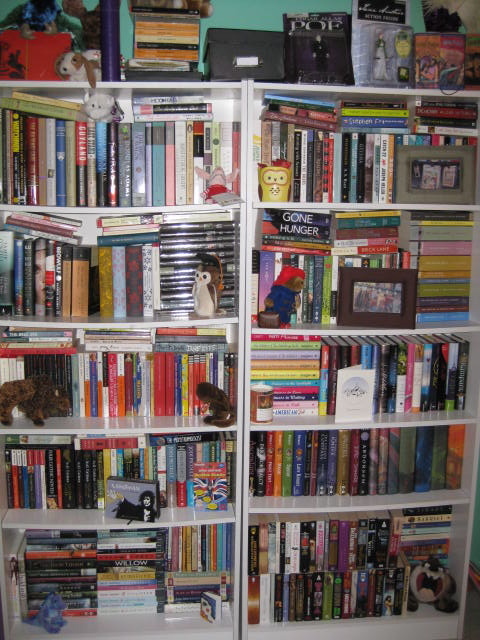 I purged my books a few months ago and rid my shelves of almost a 170 books. Mostly books I liked the idea of reading - Kafta, for example - but knew I would never actually read. It was liberating, really, more so then I imagined it would be. I sold some, gave some to friends, donated some etc. I do set reading goals for myself. I have long term goals (my Newbery Goal) and my short term (read a Pulitzer Prize book by the end of the month). Also, I use a triade rule - one fiction, one non-fiction, one Christian. If I read to much of one thing, I get lop-sided and narrow and I don't like myself when I'm that way.